Natto • Small Soybeans. How Great for Gut? Home » Fermented Vegetables » Natto • Small Soybeans. How Great for Gut? Natto is unique—many love it and eat it almost every day. But others are put off by the smell of ammonia and old socks, and the stringy, sticky texture. Indeed, natto may not be love at first sight, it’s more of an acquired taste. You have to give some time to get acquainted with the somewhat odd personality of natto. But if you do try, then perhaps like me, you could get hooked for life. The key ingredient is boiled or steamed soybeans that are fermented using a unique bacteria called Bacillus subtilis. Some people who are allergic to soy can consume fermented soybeans. This is because fermentation breaks down the problematic proteins that many are sensitive to. The fermentation process creates a distinct, strong odour that some people find repugnant at first. For this reason, some people need to taste natto several times before learning to appreciate it. So giving it some time! You could compare the taste to Roquefort, one of the best known French blue cheeses. I tasted this cheese on several occasions and could not understand why other were so amazed. It too a while and several attempts before I started to enjoy its distinct taste. Now I eat Roquefort almost every day. The point is, don’t let first impressions discourage you. There are also ways to make it more palatable. Fermented soybeans should be keep in a refrigerator and consumed within a week or so. This is because its taste will gradually change. If the fermentation process continues too far, the soybeans will almost fully dissolve and develop sharp ammonia-like odour. This is similar to how certain cheeses develop. Nattokinase is a unique enzyme found in natto. It has some interesting properties as promoting a clean-up of the blood vessels, promote circulation, support the heart and preventing blood clots from forming. Fermented soybeans is a great source of vitamin K2 (menaquinone). Studies reveal that after consuming it, the K2 concentration in the body is 10 times higher than after eating spinach. Vitamin K is essential for healthy bones and prevents the hardening of arteries. However, K2 can interfere with the function of Warfarin. In earlier times, rice bundles were filled with steamed beans and then stored in a warm, humid environment. This resulted in fermentation by Bacillus natto, a bacterium that lives in rice straw. 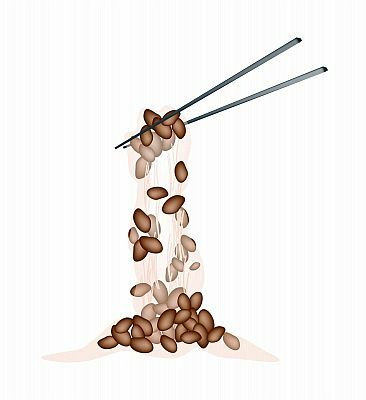 During fermentation, the soybeans decompose, generating the distinctive natto strings, which can stretch up to 20 feet [6 m]! Nowadays, natto is mass-produced in automated factories, where steamed soybeans are sprayed with the ideal amount of Bacillus natto. The beans are then transferred to small containers by machine. A conveyor moves them to storage, where preset temperature and humidity levels allow the beans to ferment and mature. After packaging, the natto is ready for market. Most commercial natto is well-prepared and delicious. When you take it out of its package, pour it into a bowl and, using a fork, whip it about 50 times until it gets kind of foamy. Natto is usually not eaten by itself. One reason is the texture; it is easier to swallow together with some condiments. Together with white rice is the traditional combination. To this you can add fermented vegetables, scallions, yellow mustard, raw red onions, salt, seaweed, wasabi or mayonnaise. When served with rice, it is best to mix the beans thoroughly. The more you mix them, the more strings will be produced. Try eating natto with kimchi—it’s a superb marriage! Try eating it the traditional way—seasoned with soy sauce. It can also be served with spaghetti, Japanese noodles, and even soup. Some enjoy it on buttered toast. Once you start consuming it, you might be surprised how well natto makes you feel. This is especially true if you consume it regularly, even on a daily basis. Therefore, give natto a chance. Don’t be scared by its stinky and slimy reputation. Who knows, you might even end up loving it! This is an ever changing personal blog. All recipes and recommendations on this website are for informational purposes only and reflect my own opinions. I do not make any guarantees or promises regarding the accuracy, reliability or completeness of the information presented. Therefore, do not take statements on this site as a substitute for professional advice, because they are not. If you need help, please turn to a professional dealing with your specific needs.